I know I said that I was done with the cherry recipes, and I am sorry that I misled you, but I really thought their season was over. Turns out I was wrong. 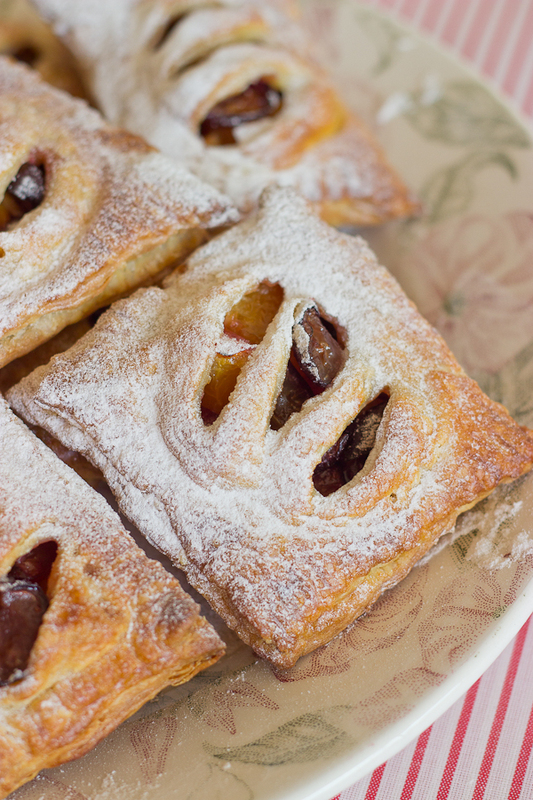 And how good it feels to have them around for a little longer!These mini peach and cherry pies are a no-brainer. They are a very easy breakfast, that’s what they are. I’ve been leaning towards easy treats lately with all the heat and relaxed mood that the summer brings. 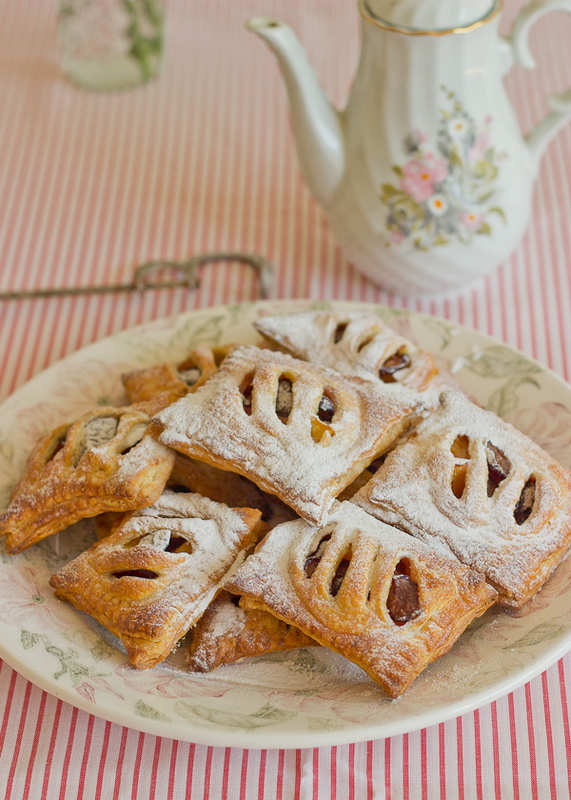 I used the two juiciest summer fruits to create these mini peach and cherry pies, but really, it’s up to you what fruit to use. The summer is so generous and I feel obliged to devour everything it has to offer. Only 5 ingredients and 30 minutes are keeping you away from these summer pies. Besides being incredible easy, they are also very versatile. They are perfect for a lazy breakfast with a cup of black coffee, very convenient picnic food, you can take some for work or just have one every time you enter the kitchen. 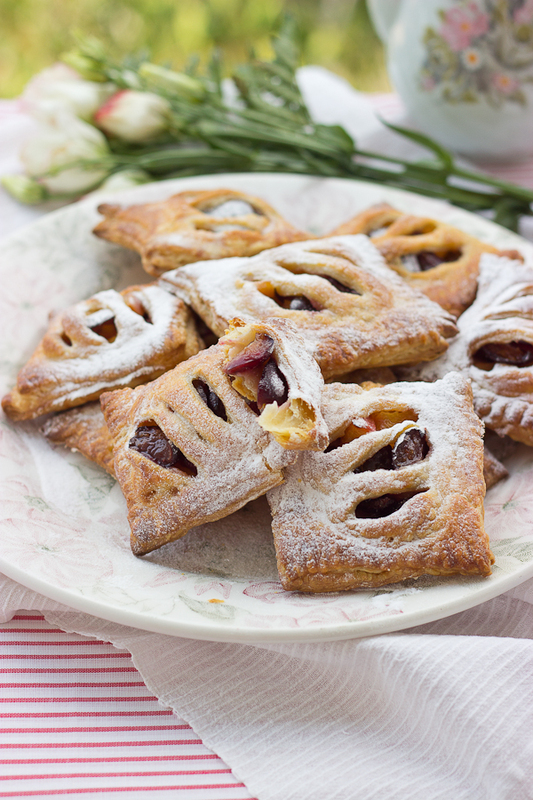 The combination of the crispy puff pastry and the sweet, juicy fruits is divine and even though they get softer with time, I am sure you won’t mind, since the flavors get even more intense. 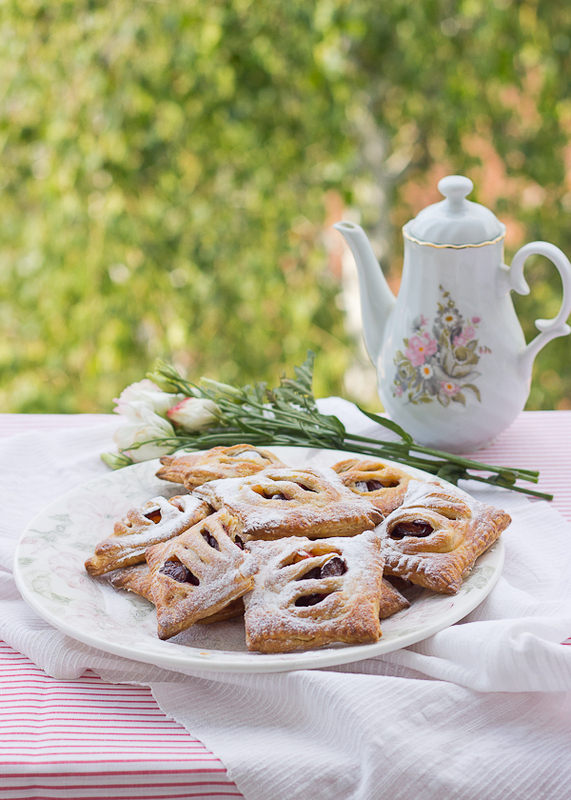 5 ingredients mini peach and cherry pies, ready in 30 minutes. Enjoy the summer fruits in a blink! Prepare 2 large baking sheets and line them with parchment paper. Preheat your oven to 200°C/390°F. Mix the diced cherries and peaches with the sugar in a small bowl and set aside. Place the cold dough on a generously floured surface, dust with more flour and gently roll it out with a rolling pin, stretching it with approximately 5 cm/2 inches per side. Drain any liquid from you fruit and place two teaspoons of fruits in the center of half of your squares. Cut small incisions on the rest of the squares and arrange them over the fruit. Seal the pies, pressing the edges with a fork. Arrange on the prepared baking sheets, brush with the beaten egg and bake for 15 minutes, or until golden. Let cool in the pans and dust with powder sugar. *I cut the longer side into 6 stripes and the shorter side into 4 and I got 24 “squares”.